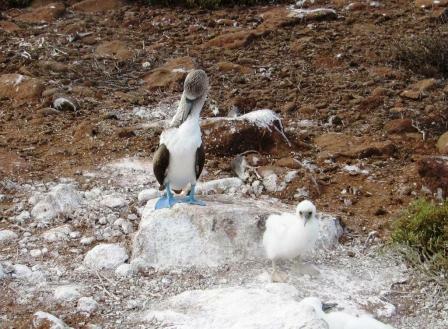 These boobies live off the western coasts of Central and South America. The Galpagos Islands population includes about half of all breeding pairs of blue-footed boobies. Like other boobies, blue-foots nest on land at night. When day breaks, they take to the air in search of seafood, sometimes fishing in cooperative groups. They may fly far out to sea while keeping a keen eye out for schools of small fish, such as anchovies. When their prey is in sight, these seabirds utilize the physical adaptations that make them exceptional divers. They fold their long wings back around their streamlined bodies and plunge into the water from as high as 80 feet (24 meters). Blue-footed boobies can also dive from a sitting position on the water's surface. 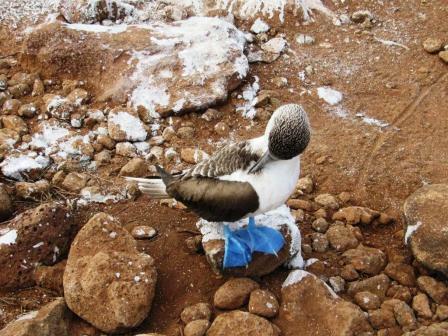 All half-dozen or so booby species are thought to take their name from the Spanish word "bobo." The term means "stupid," which is how early European colonists may have characterized these clumsy and unwary birds when they saw them on land—their least graceful environment.